Heirloom lettuce growing under a trellis. There is nothing like food which has literally been ripped right off the vine and stuffed into your mouth. Just envision plucking a ripe tomato from the vine and enjoying the burst of flavor as you take your first bite or taking apart a pea pod and plopping the small peas into your mouth. Indescribable. This long-distance, large-scale transportation of food consumes large quantities of fossil fuels. It is estimated that we currently put almost 10 kcal of fossil fuel energy into our food system for every 1 kcal of energy we get as food. Transporting food over long distances also generates great quantities of carbon dioxide emissions. Some forms of transport are more polluting than others. Airfreight generates 50 times more CO2 than sea shipping. But sea shipping is slow, and in our increasing demand for fresh food, food is increasingly being shipped by faster – and more polluting — means. Increase carbon footprint, preservatives, irradiation, and large quantities of fossil fuels used in order to eat a food that is not as nearly tasty or as good for the environment as the “plucked” one described above. So, what are the alternatives? Consider buying locally from a farmer’s markets. Ask to make sure that all their food actually is grown locally. See here to get started to find a local farmer’s market. Check your local paper as well. Farmer markets are spring up all over the place. Join a community supported agriculture cooperative or for short, a CSA. What is a CSA, you ask? “a farmer offers a certain number of “shares” to the public. Typically the share consists of a box of vegetables, but other farm products may be included. Interested consumers purchase a share (aka a “membership” or a “subscription”) and in return receive a box (bag, basket) of seasonal produce each week throughout the farming season. You can easily split an order with friends to reduce the cost or amount of food. Grow your own in containers. Many of my friends grow tomatoes, lettuce, and herbs via containers. See here for more information on how to get started. Consider joining a community garden. (See here to find one near you.) If I did not have my own garden I would jump at the chance to garden in a community. Why? The camaraderie. I recently visited a community garden during this summer and spoke to a fellow gardener about the merits of gardening in a community. He told me that the other gardeners help each us with identifying bugs and problems, many new friendships have been formed, and the best of all, they trade plants. The cost to “own” a plot was minimal. If your town does not have a community garden, consider starting one. Once you get the gardening bug, there is no cure. My own garden has gotten bigger and bigger. 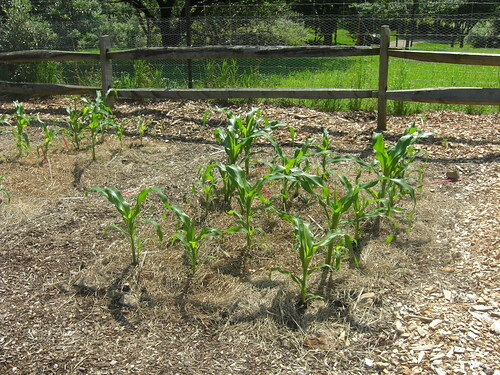 I added a second garden this summer to grow corn. Here are some pics of what is growing in my garden. 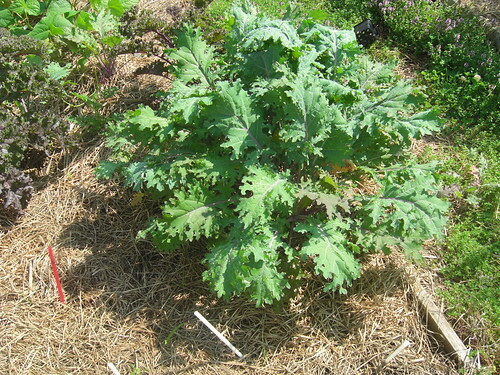 Pictured above is Russian Kale which has re-seeded itself. It is tasty right off the plant. No bitter taste at all. 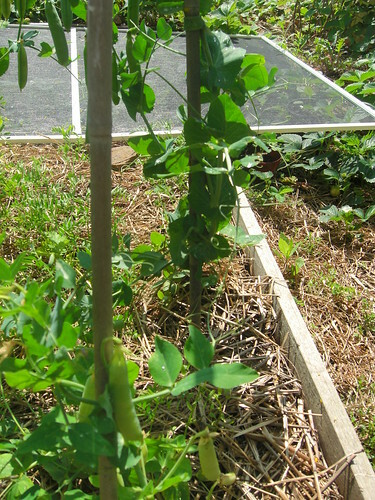 Pea pods that I am hoping will continue to grow despite the hot weather. I have hidden them in a shadier part of the garden behind very tall turnip plants. A girl has gotta hope, no? Curly thyme growing between my raised beds. 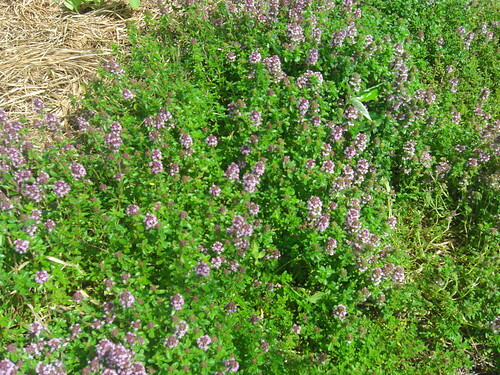 Bees were buzzing around the thyme as I was in the garden since it is in bloom. The smell is heavenly. 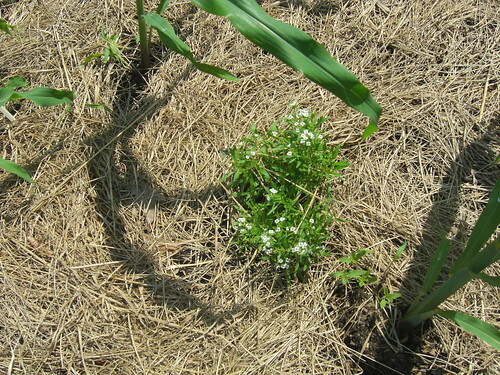 For more information about planting thyme as ground cover for your garden, see here. Knee high by July! Yep. I am growing corn. Popcorn, Gentleman’s Corn, and Blue Hopi Corn. I just hope the crows go on vacation when it starts to ripen. 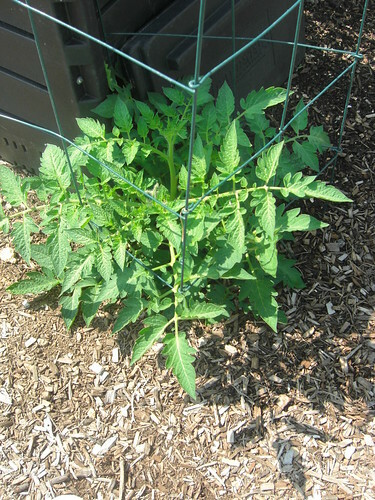 No, I did not plant the tomato plant right by the composter. It is actually growing from seeds that did not compost from last years’ tomato seeds and skins that I threw in the composter. (Remember, my adventures with making sauce with a manual tomato press?) There were actually four of them surrounding the composter. Two were moved to other beds and the remaining two are guarding the composter. 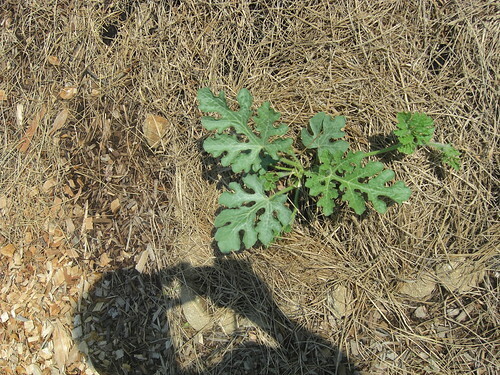 I am praying that this little watermelon plant starts growing. We have had so much rain and cloudy days that none of my heat loving plants have started to grow. My peppers look terrible and my cucumbers are wondering if it is fall. Is this not the most beautiful plant? This is amaranth, the grain. I hear that you can eat the leaves now but I am waiting to harvest it if it ever grows. What would veggies be without flowers? 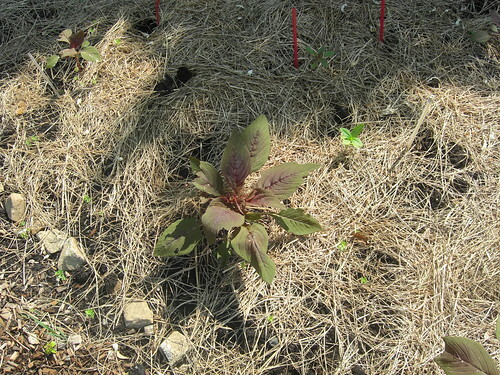 I am growing nasturtiums, marigolds, cosmos, zinnias, and Sweet Alyssum (pictured above.) I grew this plant from seed inside the house so I could see what it looked like. I am notorious for pulling flowers thinking they are weeds. This post is part of the Green Mom Carnival as to Food Matters being hosted by Alline at Passion for Green Business. Head on over to Alline’s blog to read what other green moms and mother’s of the Earth have to say. I will assure you with this group, the other articles will be fascinating. Fantastic photos!! I love shopping at the farmers market. It is so much more of an experience than pushing a cart through an overly air conditioned store and tossing week old produce in said cart. And while the food from the farmers market tastes better, much better, I’ll tell you where the best tasting produce comes from – as you said, off the vine. Pull a homegrown cherry tomato off a plant and take a bite. It really is just as good as candy! Your garden looks amazing! I’m very jealous! You are right about us looking for junk food. I love junk food but now I make my own. Tastes better and is better for us and the environment. .-= Lisa´s last blog ..Greening Your Own Birthday =-. Lisa, this garden did not happen over night. It has been 4 years of growing it (literally). It is am great outlet for me. But I love junk food too, but the garden helps me to eat healthier. If you don’t have space, or the waitlist at your Community Garden is a few years long, check out yard sharing! Hyperlocavore.com is a free community built to help you find, form and nurture a yard sharing groups with your friends, family or neighbors. Many hands make light work! 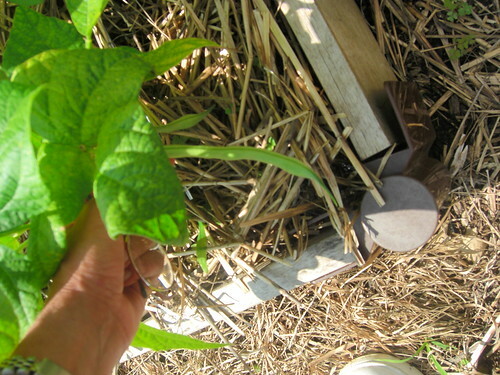 .-= Liz M owner hyperlocavore´s last blog ..Twitter hashtags =-. Anna – you have an amazing garden!! That Russian Kale is gorgeous and I love that you have a volunteer tomato growing next to your compost. You will eat well this summer! 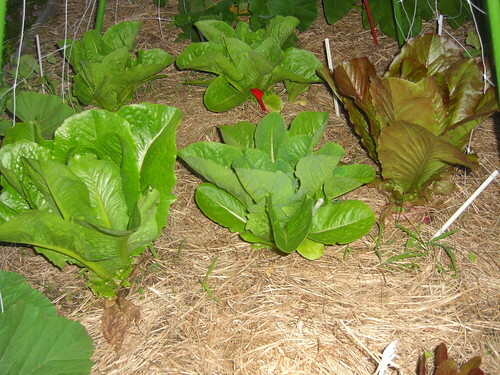 .-= Mindful Momma´s last blog ..How Does Your Garden Grow?? =-. Love the photos! Wish my veggies looked like that. At least this year I am doing containers– I couldn’t stomach the whole garden routine this year with my 2 and 4 year old. Great ideas for more local eating. .-= Katy from Non-Toxic Kids´s last blog ..New Post on Eco-Child’s Play: New Food Safety Plan Not Enough =-. Great post. I agree with you that these are great advantages to producers and consumers. I am a farmer and I love nature a lot because work in the nature restes my nerves and makes great money and I do not like to imagine my life without this. .-= Cindy´s last blog ..Soy Candles Make the Best Holiday Gifts =-. Anna, your garden looks terrific. My sad little tomatoes are growing slowly. Once again, I put them in too late. But we all need to try, right? I guess we’re spoiled here in the Bay Area with our year-round farmers markets. .-= Beth Terry, aka Fake Plastic Fish´s last blog ..Join Me for a Live Chat Today on Living with Less Plastic =-.